The icy blast of arctic air that has engulfed the country since the 24th November brought snow to many parts of the country, but Oxfordshire and some neighbouring counties largely escaped the worst of this weather, until now. 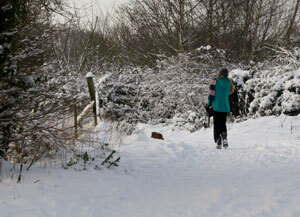 The snow finally arrived on the morning of 18th December when 14cm of snow fell in Radley in about 3 hours. 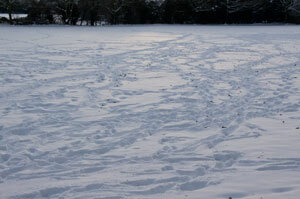 A further centimetre or so fell over the next couple of days bringing the total fall to about 15cm (6 inches). The amount of snow was comparable to last January except that this was dry powder snow which is easier to walk in but no good for making snowballs or snowmen. Long midwinter nights, clear skies and snow cover are harbingers of severe frosts and on morning of 20th December the temperature fell to around -12C. Since then, cloudy skies have kept night time temperatures up (relatively) and there has been a slow thaw during some days. However, since 24th November, there have been about 5 days when the temperature did not rise above freezing. As was the case throughout most of the country, transport was badly hit. Major roads were cleared quite quickly so the buses could keep running but most journeys involve minor roads at some point, and many of these routes were impassable or passable with difficulty for a some days. The railway continued to run, but the timetable was disrupted throughout the following week and many services were cancelled as a result. However this is the time of year when many people are trying to travel to Christmas destinations, while others are busily engaged in frantic Christmas shopping, so the impact of the disruption on people’s lives has obviously been greater than it might otherwise have been. 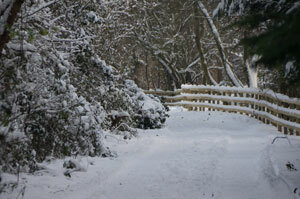 The snowy weather would have been much less unwelcome had it come just a week later! One casualty of the bad weather was the Radley Christmas Carol service, which was due to have been held last Sunday but which was cancelled at short notice much to the disappointment of many who made the effort to turn up, despite the conditions, only to find the church empty and locked. Below are some photographs taken in the parish, in the area of Foxborough Road and Thrupp Lane, on Sunday 19th December, the day after the heavy snowfall. Lovely view, shame about the house. Sandles house by Thrupp Lake. Bullfield Lake, completely frozen over. 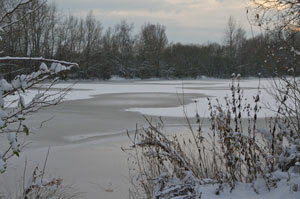 Thrupp Lake, mostly covered in ice and snow. 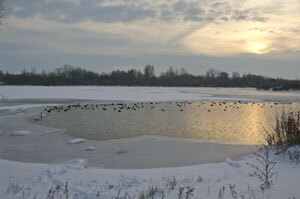 Thrupp Lake showing many birds penned in by the encroaching ice. 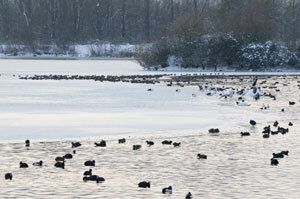 Some of the many birds crowded within a shrinking area of unfrozen water on Thrupp Lake. A closer view of some of the water birds, mostly coot and swans, on Thrupp Lake. A word of warning. The ice on these lakes is treacherous. Never be tempted to venture out onto it for any reason. (You can see from the photos that the ice is of variable thickness, due to the varying water depths underneath. This may not always be so obvious.) Do not let your dog venture onto it either. Dogs can easily get into difficulties too, and this is a major reason why some people feel compelled to take risks. DON’T! In such an event, your dog is far more capable of rescuing itself than you are. 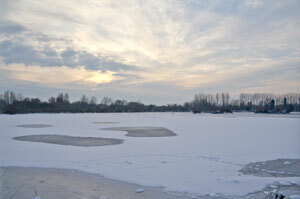 One person has already fallen through the ice on Thrupp Lake trying to rescue their dog and is very lucky to be alive. 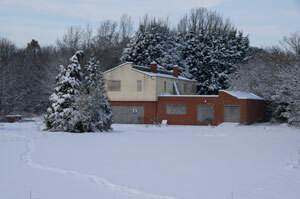 The snow remained through Christmas Day. 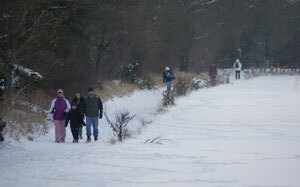 On Boxing Day, the thaw began, and by 28th December it was virtually all gone. 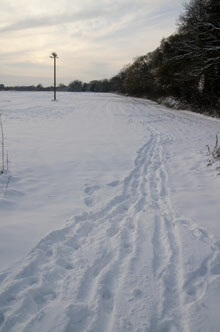 The Met Office has confirmed that December 2010 was the coldest December in the UK since before records began (in 1910).